(by Mary Hudetz and Morgan Lee, Associated Press at USA Today) SANTA FE, N.M. — New Mexico’s high school juniors would be required to apply to at least one college or show they have committed to other post-high school plans as part of a new high school graduation requirement being pushed by two state lawmakers. 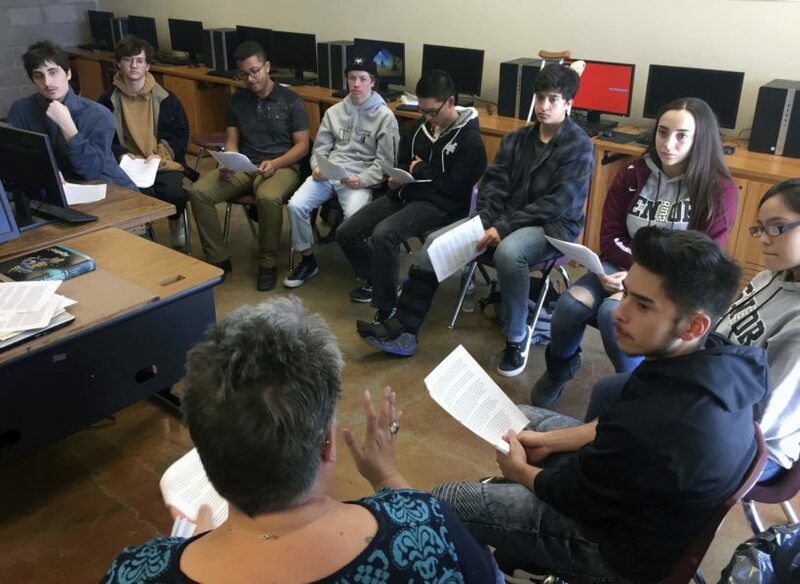 …If it eventually becomes law, New Mexico would be the first state in the nation to require post-high school plans of students, said Jennifer Zinth, who is the director of high school and STEM research at the Education Commission of the States, a Denver-based group that tracks education policy. The bill (House Bill 23) is sponsored by Rep. Nate Gentry, a Republican, and Sen. Daniel Ivey-Soto, a Democrat, would make it mandatory for public school juniors to apply to at least one two- or four-year college. Exceptions would be made for students who can prove they have committed to military service, a vocational program, or work upon graduation in an apprenticeship or internship. Parents and school guidance counselors would have to approve of the students’ plans. The New Mexico bill is modeled after a similar requirement that Gentry said was put in place for high school students in San Marcos, Texas, more than a decade ago [that led to an 11 percent jump among high school students going on to college]. And last year in Chicago, Mayor Rahm Emanuel made post-high school plans a graduation requirement – saying students had to either have plans to enter the military, take part in a “gap year” program, get a job offer or apprenticeship, or have an acceptance letter from a college. …The New Mexico bill seeks to boost the state’s college enrollment rate in the hopes the state would have a better-educated workforce. That could attract more companies to New Mexico, where the unemployment rate is 6.5%, the second highest in the U.S. and more than two percentage points higher than the national rate. While students would not be required to attend college, Gentry thinks requiring them to fill out applications will make them more likely to do so. Many of the state’s community college don’t charge application fees and applying online can take as little as 20 minutes. Applying to the University of New Mexico, however, costs $25 [and US News suggests “might place a financial burden on students. In an effort to combat this issue, Gentry, who is sponsoring the bill, would like to address the possibility of waiving the fees for in-state institutions.”] …..
From an Associated Press report published on Jan. 31 at USAToday .com. Reprinted here for educational purposes only. May not be reproduced on other websites without permission from USA Today. 1. Describe New Mexico’s House Bill 23. 2. What is significant about this proposal? 3. a) What is the aim of the bill? b) What are the probable reasons for the drop in enrollment? 4. a) What other cities have implemented such requirements? b) What effect did the Texas requirement have? 5. For what reason do the lawmakers want to increase the state’s college enrollment rate? What effect could this have in the state? -Will requiring students to apply to at least one college if they have no alternate plans cause them to graduate from college? -Would a $25 application fee prohibit students from applying to college? Should the state pay (or waive) the application fee for students? -Should all students be required to apply to college to provide a better educated workforce for the state? -Should all students be required to learn a skill or a trade that would help them to earn a living? -Should the government force students to make plans for their future? Is this government interference or necessary help?